Email confirmation is not a valid pass for season passes. A shipping and handling fee of $4.00 + HST ($4.60) will be added to each transaction. Please read the FAQ section for details. 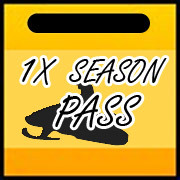 *Regular Season Price* This pass will allow a single snowmobile on the trails for the entire season. *Regular Season Price* These passes will allow two snowmobiles on the trails for the entire season. This pack is offered at a family discount and should only be purchased if both snowmobiles belong to family members living at the same civic address. *Reg Season Price* These passes will allow three snowmobiles on the trails for the entire season. This pack is offered at a family discount and should only be purchased if all three snowmobiles belong to family members living at the same civic address. 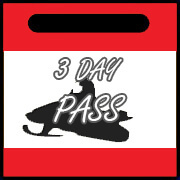 Use the 3 day pass when you're snowmobiling for a short period of time. This pass is ideal for the casual weekend rider. Use the 7 day pass when you're snowmobiling for a slightly longer period of time. Great for winter vacations. This pass offers the most value for casual riders. Use the 1 day pass when you're snowmobiling for a single day only. This pass is ideal for the occasional rider. ** The family discount provided when purchasing more than one season pass is only applicable when all passes are for a family of the same civic address as identified on your motor registration certificate. The family pass discount is not applicable to a company or organization, it is strictly for the benefit of a single dwelling "family". Dealer Demo Trail Passes are Trail Passes that Dealers can move from demo snowmobile to demo snowmobile as required and are not required to be permanently affixed to the machine. - Demo Trail Passes are available to snowmobile dealers only. 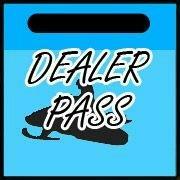 - Each dealership can purchase up to 5 Demo Trail Passes.